Loft conversions are a fantastic way to expand your living space without having to move house or endure long-winded extension work. Investing in a quality loft conversion has also been known to increase the overall value of a property, making your time and effort really pay off when it comes time to sell. When you invest in us, you can expect work that truly transforms your property. 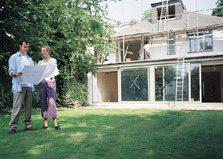 Whether you would like a sophisticated balcony or another bedroom with Velux windows, anything is possible with us. A conversion may seem complicated, but our friendly team are on hand to guide you through the process every step of the way. Whether you require assistance in regards to obtaining planning permission, or would simply like more information, we can help in whatever way your need. With more than 25 years of experience to draw on, no task is too big or small for our competent team. Based half an hour from the centre of Birmingham, we have been helping local people improve their homes for years. Once you have completed the design phase with our talented team, our professional builders can be with you quickly to carry out your renovations efficiently and conscientiously. Alternatively, you may wish to convert your cold garage into a warm habitable space. This is another route that will increase the value of your property. Whether you are dreaming of an at-home gym or an even larger kitchen, the possibilities really are endless. It is even possible just to convert part of the space, leaving somewhere for you to store your lawn mower or your children's bikes. Our team are more than happy to guide you through the conversion process; simply contact us for a quote from our team.